The opening cut here sounds like a duet by a drugged-out Yoko Ono and a primal-screaming John Lennon, but don’t be fooled. Bowie’s first album of the 80s is not only one of his best works to date but also one of his most accessible. Described by the artist as “some psychotic rock and roll by [avant-garde guitarist Robert] Fripp and some quite radical and alarming vocal performances by me,” the set winningly melds the melodic leanings of early works to the complex textures of Low, Heroes and Lodger. 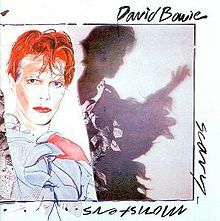 Best cuts include “Ashes to Ashes,” where the star of the vintage “Space Oddity” returns as a junkie and where the E Street Band’s Roy Bittan contributes tasty piano; and “Fashion,” a potent dance number that profits from Bowie’s sense of humor and Fripp’s manic instrumentation.